Fitz-Badger of the Soweiter League upraceed you by a fraction for the title of "1st Imagi-Nation ruler to use of of David's Highlander templates", but as I understood it his were just a 'try' not depicting a 'real' fictitious unit. We in Saxe-Bearstein have heard rumors that the vile Stagonians will be mustering some Scots in the future. Meanwhile, we appreciate the uniforms and flags depicted here. P.s. : the Lintzer Musketeers look great with purple facings! The Sumpflowen and Niederwiesen are new creations, right? Jean-Louis asks: "The Sumpflowen and Niederwiesen are new creations, right?" It's sad to think that Scotsman would stoop to work for such vile creatures as Stagonians. Are you sure they aren't Irishmen disguised by kilts? I mean, the Irishmen will even work for Bad Nachtschwein. Those kilted types rumored to be in the employ of Stagonia are probably Sassenachs! Anyone can buya kilt from those woolen shops. Buy? Rumor has it that the vile ones have managed to STEAL a large shipment of plaid cloth. A valid point. I suppose even Vile Stagonians can appreciate the fine thing that is a man in plaid. 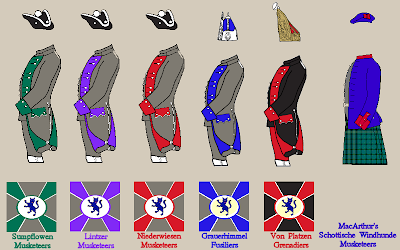 agreed; I think that to 'look right' a Lace Wars army must have a large majority of units in tricorn. which of the uniform variants on display did you choose for The Saxe-Urquhart Highlanders? The Markgraaf is jealous and wants to know if you are shipping any uniforms along the Rubberneckar River any time soon? Our wreck....err salvage and recovery people are standing by. Sorry - missed this. Was the comment addressed to David Linienblatt of Tippelbruder?